Therapeutic Interventions with Babies and Young Children in Care is about the value of observation and close attention for babies and young children who may be vulnerable to psychological and attachment difficulties. Case studies explore the potential for observation-based therapeutic approaches to support caregivers, social workers and professional networks. 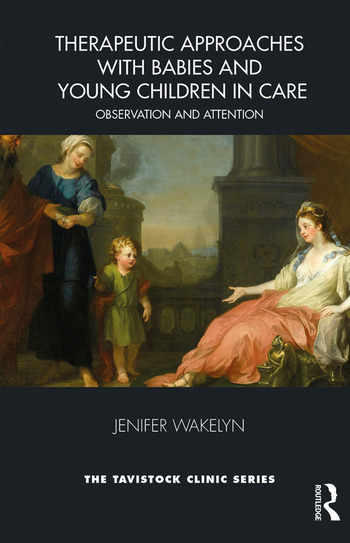 A third theme in the book is the roots　of observation-based approaches in psychoanalytic infant observation and the contribution of these ways of working to professional training and continuing development. Using case examples, Jenifer Wakelyn illustrates observational ways of working that can be practiced by professionals and family members to help children express themselves and feel understood. The interventions focus on the early stages of life in care and on the ‘golden thread’ of relationships with caregivers. The book explores contemporary neuroscience and child development research alongside psychoanalytic theory to explore the role of attention in helping children to develop the internal continuity that sustains the personality and protects against the fragmenting impact of trauma. Therapeutic Interventions with Babies and Young Children in Care is written for social workers, teachers, medical staff and other professionals whose work brings them in contact with the youngest children in care; it will also be relevant for commissioners, managers and trainers as well as mental health clinicians who are starting to work with children in care. It will provide a valuable insight into the lives of infants and young children in the care system and the applications of psychoanalytic infant observation. Chapter 6: Briefer interventions: Watch Me Play! Jenifer Wakelyn is a Child and Adolescent Psychotherapist at the Tavistock and Portman NHS Foundation Trust. She teaches and supervises in the clinical training in child psychotherapy at the Tavistock Centre and has given presentations across the UK and in France, Italy, Norway and the Ukraine about her research on therapeutic interventions with babies and young children at risk.